Encoder feedback interface for connecting a range of motor encoders to the Optidrive P2 and Optidrive P2 Elevator. 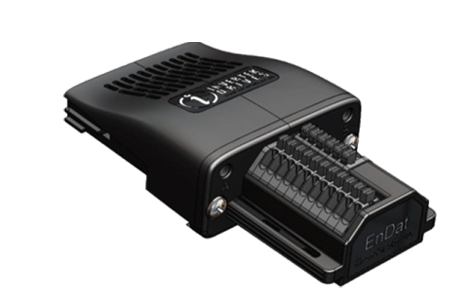 OPT-2-ENCOD-IN is a plug in encoder feedback interface for Optidrive P2 or Optidrive P2 Elevator, allowing closed loop motor control. The interface is compatible with 5 volt TTL type encoders only, up to 4096 ppr. OPT-2-ENCHT-IN is a plug in encoder feedback interface for Optidrive P2 or Optidrive P2 Elevator, allowing closed loop motor control. The interface is compatible with 24 volt HTL type encoders only, up to 4096 ppr. OPT-2-ENDAT2-IN is a plug in encoder feedback interface for Optidrive P2 Elevator, allowing closed loop motor control of permanent magnet elevator motors. The interface is compatible with Endat type rotary encoders only (Endat 2.1 & 2.2). Includes Brake release monitoring (in compliance with EN81-20 - protection against unintended car movement). OPT-2-SINCOS2-IN is a plug in encoder feedback interface for Optidrive P2 Elevator, allowing closed loop motor control of permanent magnet elevator motors. The interface is compatible with Heidenhain ERN1387 SinCos rotary encoder only. Includes Brake release monitoring (in compliance with EN81-20 - protection against unintended car movement).